Even if you have all the necessary resources and management in place, you will need to conduct market research before taking your business into the marketplace. This market research will display the size and level of demand in the available market and will allow you to identify aspects through which you can position your brand effectively and differentiate yourself from competitors. With this information, you can avoid taking risks with your business and capitalize on your available opportunities. 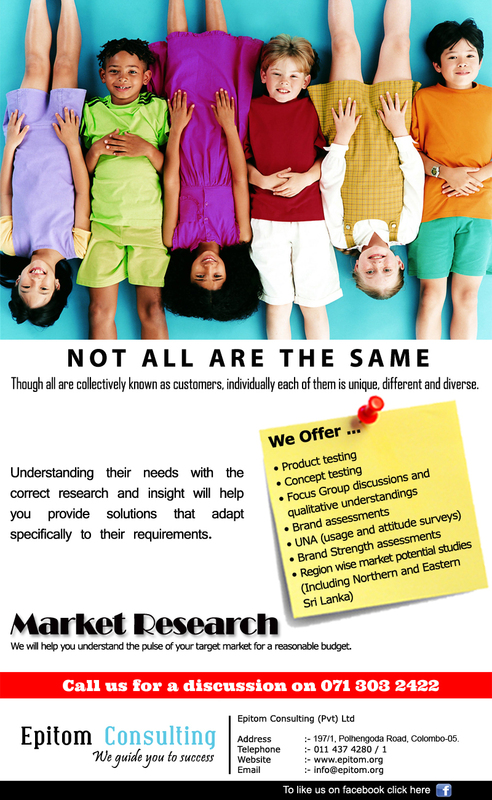 Epitom Consulting is a quality provider of market research in Sri Lanka, and we can perform an in-depth industry analysis to help you target the perfect niche for your business. Our market research analysts will be able to empower both small business marketing as well as large brand marketing efforts in reaching the right audience.